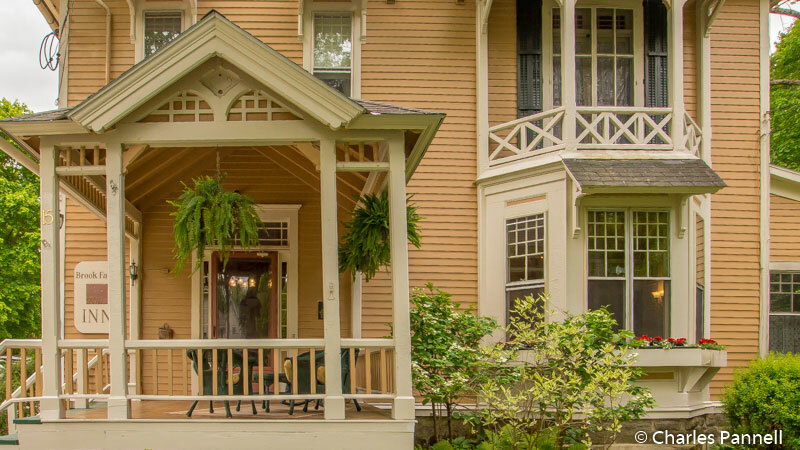 Located in the sleepy village of Lenox, Massachusetts, the Brook Farm Inn (www.brookfarm.com) is the quintessential New England inn. This 1882 property went through a number of owners, before Linda and Phil Halpern purchased it in 2001. They devoted the next several years to refurbishing this aging gem; and when they added the Carriage House rooms in 2003, Phil was determined to make at least one of those rooms wheelchair-accessible. Since both of his parents used a wheelchair in their later years, Phil wanted the new addition to be as accessible as possible, so everyone could enjoy his little piece of heaven. And in the end, he added not one, but two accessible rooms to his inventory. Today Angela Lomanto and John Nelson have taken over the property; however the access improvements of the Halpern’s live on. The Carriage House is located behind the main house, and it features two large and luxurious rooms — the Shadowood Green Room and the Shadowood Burgundy Room. There’s level access from the adjacent accessible parking space over to the rooms, and barrier-free access throughout both spaces. The Shadowood Burgundy Room is decorated in tones of cream, pink and burgundy, and features a level threshold, wide doorways and plenty of room to maneuver a wheelchair or scooter. It’s furnished with a 25-inch high queen-sized bed with wheelchair access on both sides, a love seat, a small coffee table, a chest of drawers, and a writing desk with a chair. Round out the furnishings with a fireplace and a refrigerator and you have a very comfortable space. 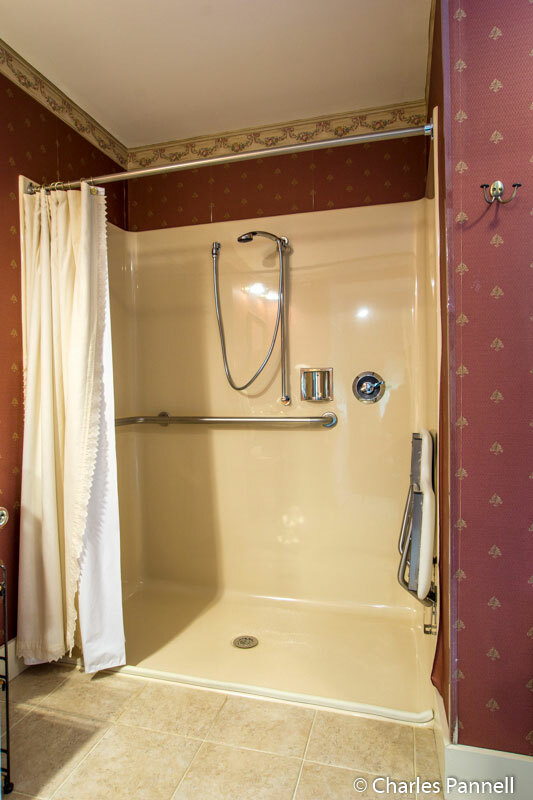 The large bathroom has a standard two-person Jacuzzi tub and a roll-in shower with grab bars, a hand-held showerhead and a fold-down shower seat. 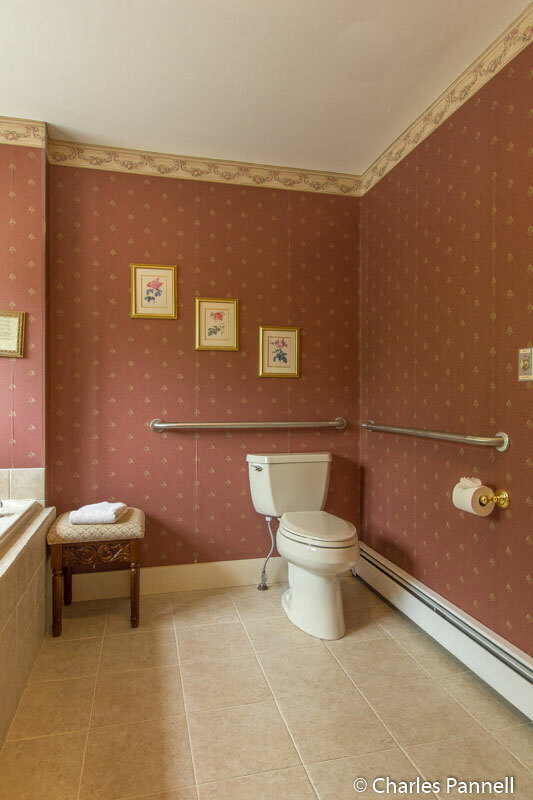 The toilet grab bars are located on the back and left walls (as seated), and there’s also a roll-under sink in the bathroom. The Shadowood Green Room has the same access features, except it’s decorated in tones of green. Best of all, there’s extra insulation between the two rooms, so guests have plenty of privacy. There’s also level access from both rooms out to the front deck that overlooks the beautiful garden. Breakfast is a grand affair at the Brook Farm Inn, and Angela and John pull out all the stops. The buffet features a variety of side dishes, with a slant towards healthier selections. Entrees range from spinach-mushroom baked eggs to almond meal buttermilk pancakes, or maybe even scrambled eggs with boursin and salmon. As an added treat, lox and bagels are available on Saturday mornings during the summer. And although there are steps up to the historic main house, breakfast can be delivered to your room if you can’t manage them. 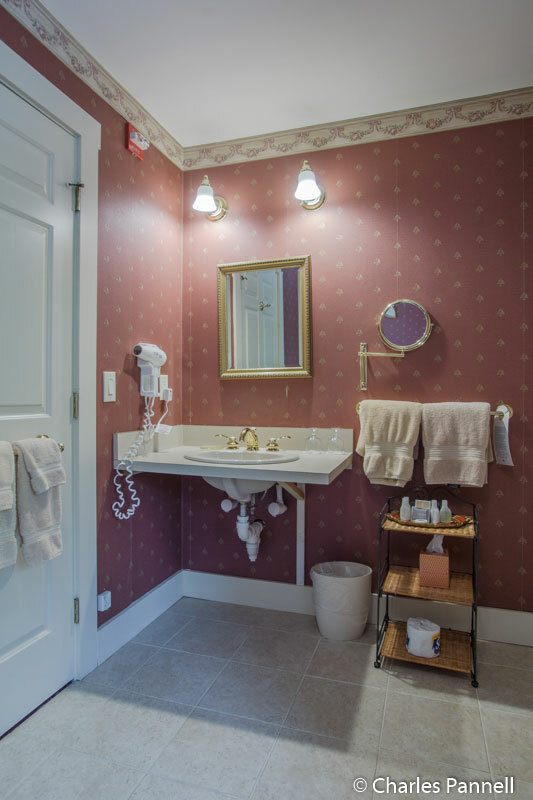 The Brook Farm Inn is a great place to unwind, relax and enjoy the slower pace of this quiet New England village. 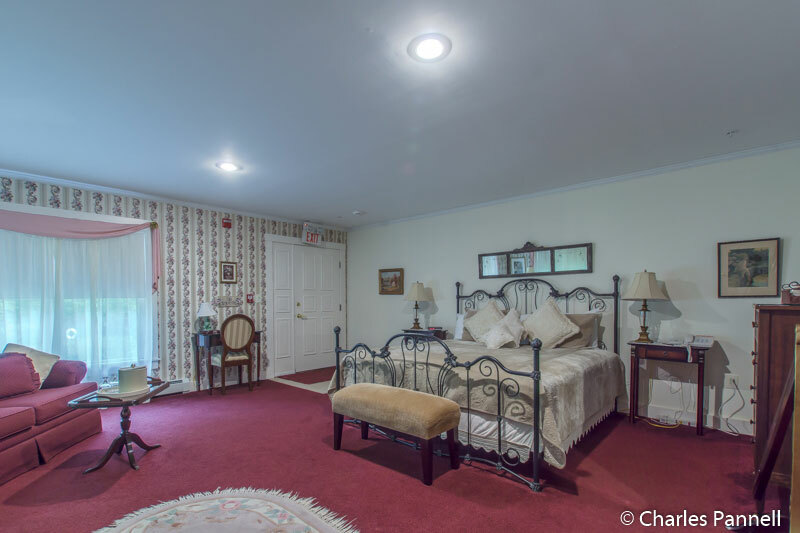 And thanks to some very forward thinking innkeepers, everyone can enjoy this luxurious Berkshire retreat.